Ahead of Bat Appreciation Day we asked Sonja Vernes, who works on the neurogenetics of vocal communication and is also co-author of research published in BMC Genomics, to tell us more about her work with this mammal and why it is that we should appreciate them. What can bats teach us? For many people, the mention of bats evokes thoughts of horror stories, vampires and scary creatures of the night, but there are lots of reasons to be appreciative of bats and all the wonderful things they do. To start, bats make up around one fifth of all mammals on the planet and because they are voracious insect eaters – with some bats munching on up to 8000 insects a night – they serve as a natural pest control mechanism. They reduce the number of disease carrying mosquitoes, crop destroying bugs, and even make it more pleasant to sit outside on a summer evening. Next to this noble service, bats also keep our ecosystems healthy by performing a role normally only associated with the birds and the bees – pollination. Bats help to pollinate many species including bananas, baobab trees and eucalyptus. Without bat pollination of agave trees we wouldn’t be able to make tequila! In addition to this, bats have developed some very special skills. They are the only mammals able to fly, they can use sound to navigate their environment (echolocation) and have developed specialized immune systems that are resistant to many nasty viruses that would be lethal for humans and many other animals. Imagine how useful it would be to understand the way their immune system works to get a grip on diseases like rabies. I became interested in researching bats because they share a trait with humans that few other animals have. As human children learn how to speak, they need to learn from adults how to produce the right sounds to make meaningful words and sentences (vocal learning). Some bat children do something very similar, they also learn vocalizations from adults so that they know how to produce the right calls or songs. This is why my lab is now using bats as a way to understand how genes contribute to vocal learning, and how these molecular mechanisms relate to human spoken language. Speech and language disorders can be caused by mutation of some genes in humans and therefore those must be important for how we normally use language. Being able to investigate these genes in bats means that we will be able to understand what they do in a living animal, how the genes normally function, and why mutation of the genes can cause deficits in a trait like vocal learning. In bats, we are able to look not just at individual genes, but at the expression of all the genes in the genome simultaneously. Using this approach, we recently identified molecular pathways acting in a region of the bat brain known to be involved in vocalization (see here), and the next step will be to link such pathways directly to vocal learning behavior. 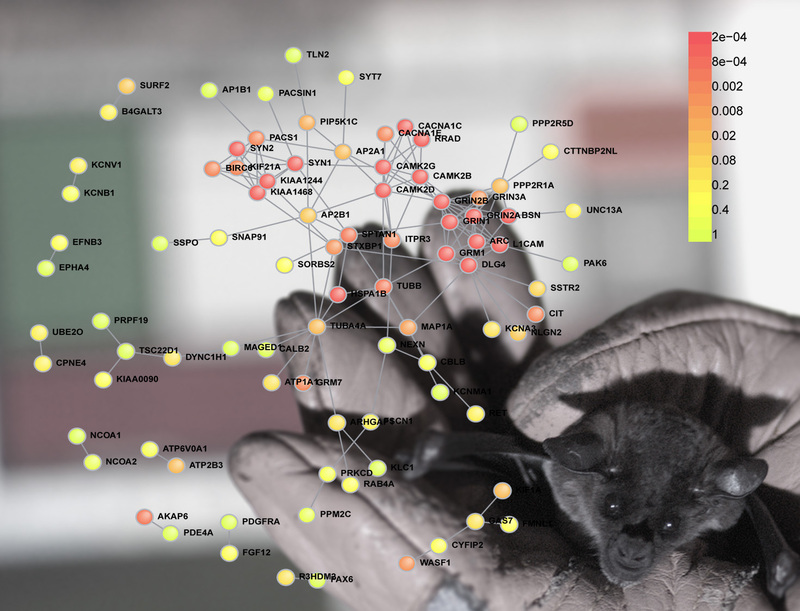 Given that humans and bats share this behavior, uncovering these molecular networks involved in vocal learning in bats may also point us to new genes involved in human speech and language disorders. In the future, taking a genomic view of bats is likely to reveal fundamental principles about how these and other traits have been shaped by evolution. By studying vocal learning in bats, we are only scraping the surface of what this fascinating animal has to offer when a genomics approach is taken. Pioneering genome-level studies are also uncovering how other traits like echolocation, flight and immunity are genetically encoded in bats (for examples see here, here and here). So on bat appreciation day, we should remember that not only are bats doing important jobs in our ecosystems, but they are helping us to understand how complex traits are biologically encoded and how they might have evolved, and maybe bats can even tell us how humans learn to speak. Dr. Vernes is a Research Group Leader at the Max Planck Institute for Psycholinguistics in Nijmegen where she heads the Neurogenetics of Vocal Communication Group and studies the links between genes, animal communication, and human language.